Preheat oven 425 degrees. Cover the bottom of a baking sheet with parchment paper. Wash potatoes and wipe dry with towel. Remove any blemishes but leave skin on. Cut the potatoes in half. Place in a medium size bowl. Sprinkle with salt, pepper and olive oil. Gently mix the potatoes until all surfaces are covered. 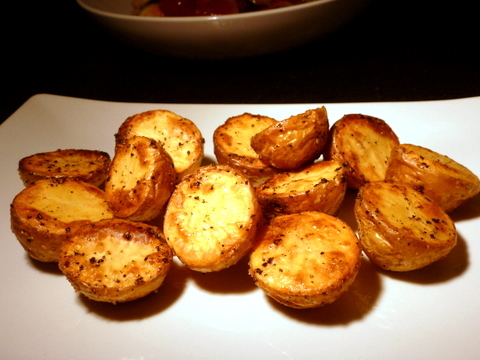 Place the potatoes on the baking sheet cut side up and roast potatoes for about 20 minutes or until they are golden brown. Serve warm.